When creating a quick layout I often like to include one special element to add interest and dimension to my page. In this layout I show you how to spice up your page with a fun title constructed from other elements featured on the page. This layout was created with KI Green Thumb paper, KI Painted Stripe paper, green cardstock, green alphabet stickers, a green leaf brad, brown ink and a brown pen. Begin by matting your photo with your KI Painted Stripe paper. Depending on your photo, you may wish to mat in on cardstock first. Position your photo in the top right-hand corner of your page but do NOT adhere yet. Once you know where your photo will be positioned, set it aside. Use a craft knife to cut out the letters of 'Garden' as well as two leaves (one small, one large) from the area under your photo. Make sure your cuts remain within the boundaries of where your photo will be. When you have finished cutting, adhere your photo in place (this should cover the holes you have just made). Please note - If you do not wish you use the word 'Garden' in your title, you can make your own word by stamping your letters onto small white tiles and matting them on green cardstock. Next, cut a strip of the green section of your Painted Stripe paper. Use your brown pen to journal on this strip. Position underneath your photo, as shown in the layout above and adhere in place. 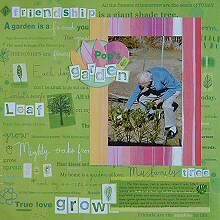 Embellish your journaling with your large leaf cut-out on the left and your green leaf brad on the right. Now all that is left is to create your title. Begin by cutting a circle approximately 6.5cm in diameter from green cardstock. Ink the edges with brown ink and set aside to dry. Cut two more circles. The first should measure approximately 3.8cm in diameter and be cut from the pink stripes of your Painted Stripe paper. The second should measure approximately 2.2cm in diameter and be cut from the yellow stripes of your Painted Stripe paper. Cut three leaf shapes from your Painted Stripe paper. You can use a template or draw them freehand. Make sure each leaf uses different shades from your Painted Stripe paper. It is now time to piece your title together. You may wish to play with the arrangement a little before sticking everything down. Begin by positioning your green circle on your page, overlapping it with your photo. Position your pink circle on top and then your yellow circle. Tuck your small leaf in behind the yellow circle. Next, arrange your leaves from left to right so that the third leaf overlaps with your pink circle. They should also be arrange light to dark. Finally, arrange the letters of 'Garden' (or whatever word you have chosen to use) across the bottom of your design and use your green alphabet stickers to finish off your title. And voila! You now have a unique title for your page!